The ruling families and traditional tribal structures influence domestic politics considerably. Political parties or trade unions are not permitted and opposition is virtually non-existent. The Federal National Council (FNC) as a legislative body has only an advisory role. The UAE will maintain an assertive foreign policy in order to increase its regional influence in light of continued insecurity in the Middle East. The country is part of the alliance against the Islamic State (IS), and as such it has launched air strikes against IS in Syria and Libya. At the same time, its armed forces are part of the campaign against Houthi rebels in Yemen, co-led with Saudi Arabia. The UAE was also one of the initiators (together with Saudi Arabia) to impose sanctions on Qatar, for suspecting the country of sponsoring terrorism. Diplomatic ties and transport links have been cut, and Qatari nationals have been asked to leave the UAE. 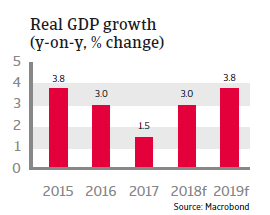 After a subdued performance in 2017 economic growth is expected to accelerate to 3.0% in 2018 and 3.8% in 2019, supported by higher oil prices, stronger external demand and the easing of fiscal consolidation. Increased infrastructure spending in the run-up to the World Expo 2020 event hosted in Dubai will also stimulate economic activity. Inflation is expected to temporarily increase to about 4.5% in 2018 as a result of the 5% VAT introduction in January 2018, while house prices continue to decrease due to strong supply growth and still modest domestic demand conditions. 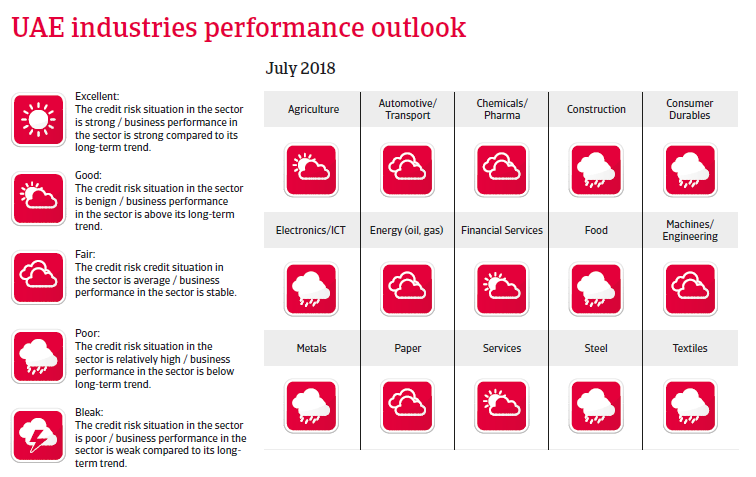 Government revenues will increase amid higher oil prices and the implementation of several non-oil revenue raising measures (excise duties, VAT introduction). 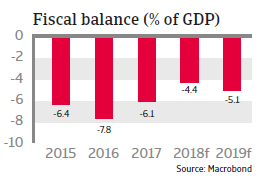 However, fiscal consolidation will be relaxed somewhat, with more attention given to welfare spending (in order to stem any discontent after previous subsidy cuts) and to accelerate economic diversification. At the same time heavy capital spending will continue, particularly by Dubai in the run-up to the 2020 World Expo. Therefore, the fiscal deficit will decrease only marginally in 2018 and 2019. The UAE can afford this more gradual fiscal adjustment as long as the actual oil price is above its fiscal break-even oil price of around USD 62 per barrel. 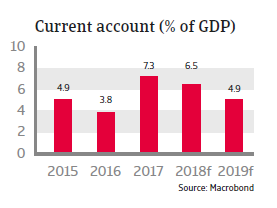 In 2018 and 2019 the current account surpluses will be lower than before the oil slump (around 4-5% of GDP compared to 13.5% of GDP in 2014), despite the oil price rebound and stronger external demand. Maintaining the currency peg of the dirham to a stronger USD hampers competitiveness of non-oil sectors and diversification efforts. However, there is little risk of the dirham being de-pegged, as large foreign currency assets provide strong support. The banking sector is well capitalized with a capital-adequacy ratio of 18.6% at the end of 2017, while the liquidity squeeze during the recent oil price slump has ended and government liquidity has rebounded beyond pre-crisis levels. However, private credit growth remains subdued at about 1% year-on-year due to several interest rate increases, as the Central Bank is tracking US Federal Reserve interest rate hikes. Despite progress made in debt restructuring on some government related entities, a high gross external debt level of USD 240 billion (62% of GDP) remains from the property market crisis in 2008/2009. Additionally, the lower current account surpluses have increased financing requirements. That said, the UAE should be able to meet its repayment schemes that will peak in 2018 and 2019. A successful USD 10 billion bond issue of Abu Dhabi (that included a 30-year bond) at the end of last year underlines that capital market access is good, and a law that allows bond issuance on a federal level is in the pipeline (a right that is currently reserved for individual emirates only). In addition, the UAE can fall back on large Sovereign Wealth Funds that have an estimated total value of over USD 1.3 trillion (above 300% of GDP). 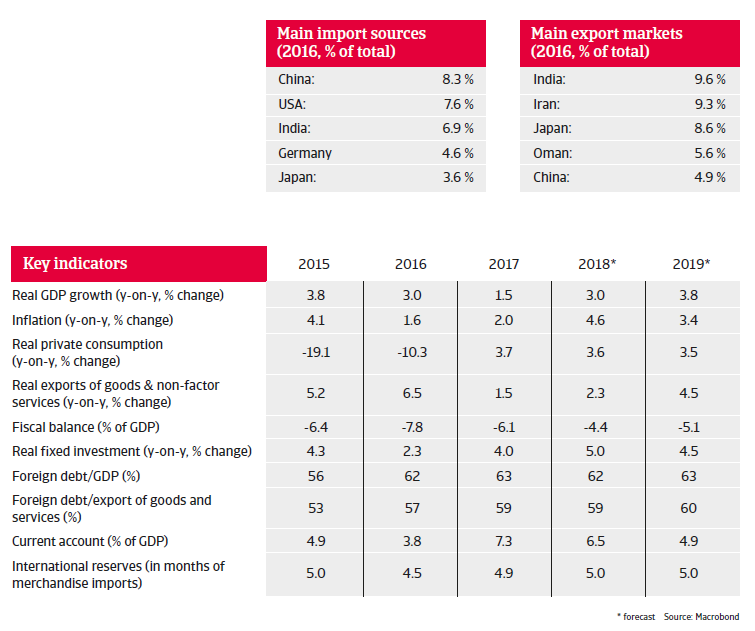 Currently non-oil sectors account for 70% of the UAE´s total GDP. The government´s strategy is to further diversify the economy away from oil in order to ultimately establish a knowledge-driven economy in the long-term. The aim is to increase the GDP share of non-oil sectors to 80% by 2021. There is still scope for further cementing the UAE’s role as a commercial hub, for example by relaxing constraints on foreign direct investment and easing access to finance for small and medium-sized enterprises.